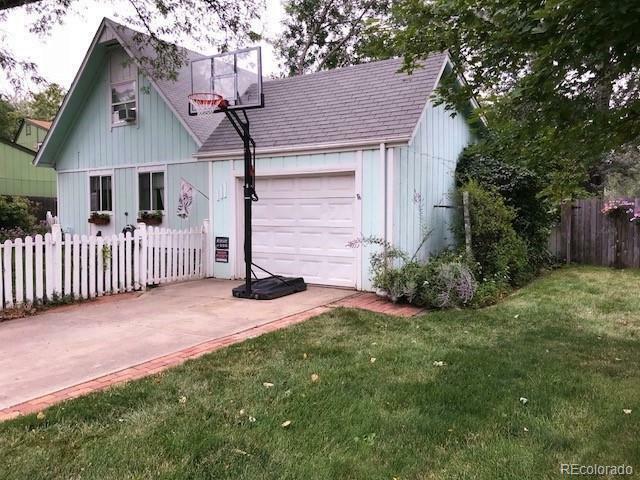 This pretty little Cape Cod style home is located on a low-traffic cul-de-sac with lots of trees. FOUR BEDROOMS and TWO BATHS help this home to work well for many types of buyers. The two smaller bedrooms are located on the main level, and are serviced by a full bath which is directly accessed through the MBR. The other users can enter it from the hallway. The larger bedrooms are upstairs and are serviced by a 3/4 bathroom. The one-car detached garage is just steps from the house, and it is oversized (312 s.f.) for additional storage or work area. There is another storage shed attached to the rear wall of the garage, and it is accessed from the large covered patio which is right off the living room (through sliding glass doors). The yard is lovely, with mature trees and some fruit trees, and rasberries and other garden favorites are out in the large garden space. MAKE CERTAIN TO INCLUDE LEAD BASED PAINT DISCLOSURE WITH ALL OFFERS.